Part of maintaining the value of your fine jewelry includes the occasional visit to the jewelry repair shop. These days, unfortunately, most jewelry repair is outsourced and unnecessarily pricey, but that isn’t the case at Lustig Jewelers. Our on-premise seasoned and talented jewelry repair technician may even be able to complete your repairs while you wait. At Lustig Jewelers, we know that both your jewelry and your time are valuable, and we are committed to repairing your jewelry quickly and professionally. Lustig Jewelers carries a wide array of jewelry findings and parts as well as the largest gemstone inventory in the region. This ensures prompt repairs to your exact specifications as well as jewelry repair prices that are unmatched anywhere. If you have to leave your diamond with us during repair, we will plot the stone, indicating all unique internal traits, which will give you a peace of mind that your diamond is safe. Add to the sentimental value of bracelets or rings by getting them engraved with names, dates, or other special details. We ensure beautiful custom jewelry engraving that is always accurate and readable. Engraved jewelry makes for a particularly meaningful gift--for weddings, anniversaries, birthdays, etc., and can be completed on-site in a timely manner. 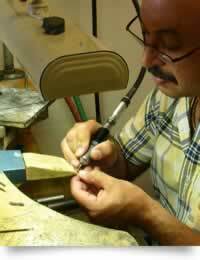 In fact, in most cases, Lustig Jewelers can guarantee same-day engraving. We provide affordable jewelry engraving on pieces you bring in and free jewelry engraving on all pieces purchased at Lustig Jewelers.